I have been making cupcakes like a mad woman the last few weeks, particularly this last week. My sister is having a celebration for her baby today and I had to make over 100 cupcakes for the event. Needless to say, I have been making cupcakes, freezing them and repeating. Being crammed for time, I like to take as many shortcuts as I can BUT still produce moist, delicious and perfect cupcakes. That’s where this amazing recipe comes into play. I made this chocolate cake recipe a couple years ago with my mom and the recipe has stuck with me. I like to adapt it to whatever flavor I am craving, which is what I did today. You may remember a similar picture to today’s post from my Vanilla Bean Buttercream recipe. Well, today you get the cupcake recipe that goes along with the picture. Trust me, this is one cupcake recipe you are not going to want to lose! How to take a box cake mix and make it extraordinary! These cupcakes are so moist and perfect! Mix all ingredients together in a large mixing bowl. Cake Batter will be THICK. Fill cupcake tins about ⅔ of the way full. Bake at 350 degrees F for 15-18 minutes or until cupcakes are golden in color. YUM! I love quick and easy cupcake recipes! 100 cupcakes?!? That wears me out just thinking about it! Whoa! Pudding mix in a cake? That sounds like such a good idea! I cannot wait to try this out! Oh I like the cake mix and pudding together. I bet this is superb! With the vanilla frosting and cherry on top this are adorable. Was just wondering how many ounces of cake mix you used since many of the large brands have decreased the amount in their mixes. Nikki These look Amazing!!! I love the add ins you used to jazz up the box mix!! I am going to have to try these. Thanks for sharing! I always adapt this recipe from Kevin & Amanda too! It makes absolutely gorgeous moist cupcakes!! Please let me know if you used the recipe as posted. Many of us had the cupcakes fall and shrink. They look awful. Looks so yummy! Thank you! I love things that make my life easier. I'm such a lazy baker. Can't wait to try these. Nikki, Looks Delicious these cupcakes. Just wondering how these would work with a sugar-free cake mix and sugar-free pudding...any ideas? What a wonderful shortcut for cake recipe! I love box mix bases so much and they're definitely under appreciated. This looks delicious! Does this work for all cake mixes? I have to make a lemon cake for hubby's bday. Would you use lemon pudding instead of vanilla? I use this recipe with chocolate chips in a 13x9 pan as a snack cake. Easy Peasy !! Never thought about doing cupcakes. They look delish. Love this post, thank you. 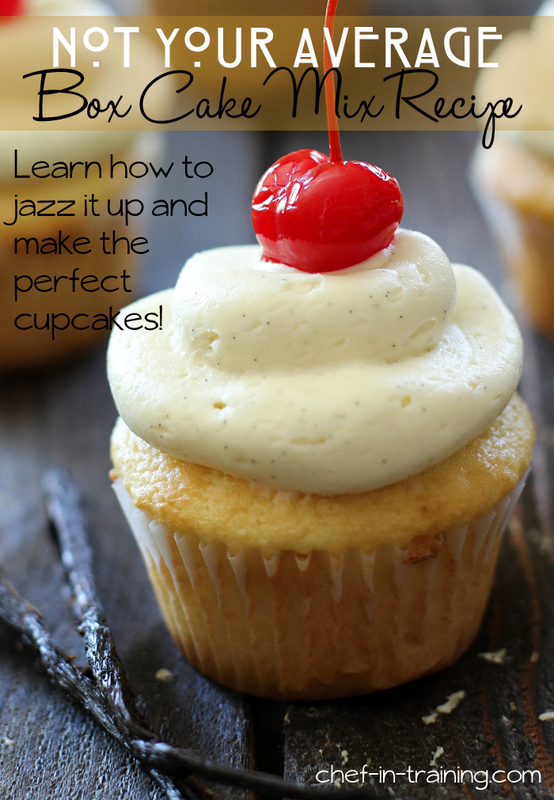 I was looking for a way to jazz up store bought cake mix. These look great. Would love the recipe for the frosting as well! Love that you jazzed up the cake mix with sour cream and pudding mix. I bet that makes it incredible! These look Amazing! I bet they taste even better then they look!! Thanks for the recipe Nikki! :) P.S. You look gorgeous! I made this last weekend with Devil's food cake mix and chocolate pudding. It was fantastic! I got so many compliments on how moist and delicious it was! Thanks! I also filled them with raspberry jam and made raspberry buttercream icing! I had high hopes for these...but for some reason, once out of the pan and cooling, they shrunk a tad, and sunk a little. Did this happen to anyone else? Ideas? I really wanted to love this idea! Why did they sponge and cave in? Ive been baking fir 20 years and never had this happen. Can anyone tell me plz? This happened to me too! Not thrilled! Same thing happened to mine. Please help. They are tasty but look totally weird. Good thing my kids don't care how they look. To the ladies that had weird eesults- mine fell too. In 38 yrs of baking, never had that happen. I'm going to try again, but use a little less liquid. Probably omit the oil totally. The flavor of the cake was great- took it as bites to church last nite and everyone LOVED the taste. Was more like a wet pound cake in texture.. I will post my results. Mine fell a little...but they were delicious. So moist! I had chocolate cupcakes at the party too and even the chocolate lovers were switching to these vanilla cupcakes. A true foodie at work (where I took the leftovers) said: "I think this is the best cupcake I have ever had in my entire life" - and is planning on make them soon. Thanks for the recipe! Mine fell and were very dense and spongy in the middle. Very disappointing, as my Son's birthday party is tomorrow. What a waste of lots of ingredients, and now I have to stay up all night and make normal from a box cupcakes. No thanks for this recipe. Just made these...they were absolutely perfect. My son said, "Mom, those are the best cupcakes I have EVER tasted in my whole life!" I agree. I will add that after reading the comments where people had trouble with the cupcakes falling, I baked mine longer - about 20-22 min. And like I said, they were wonderful...light, fluffy, moist, and soooo flavorful. Mine looked great in the oven, but they fell as well! Ho much cake mix you need to make 36 cupcakes. This might be a silly questuon but how or where do I get vanilla bean seeds? Please , respond I'm making these for thanksgiving dinner. What is you recipe for the icing in the picture? What is you recipe for the icing in the picture? Also, I need to freeze mine. Do they freeze well and come out just as good?? How many days can I freeze without messing them up? My cake mix calls for butter should I just use the butter or substitute with oil? I would this recipe 2 stars out of 5. Mine were very spongy and fell as well. I think it was because of too much oil. They tasted OK. Would not make again. These cupcakes are amazing! I made it as a cake for a friends moms retirement party and everyone just savored every bite!! so sorry about that. It should be displaying correctly now. Please let me know if its not. Thanks so much. Hi, I want you to know that I love your recipes and pin have made several that were great. However, I have the same problem with these cupcakes that many others have had - shrunken middles. Can you tell me if you have found a reason for this or solution? These are some of the best tasting cupcakes ever, but I can't take them anywhere because of the sinking middles. Keep bringing us your delicious recipes! So I followed this recipe exactly. After 15 minutes, I checked them. They weren't golden at all so I left them in 3 more minutes. They were golden. However, as soon as I pulled them out of the oven, the cupcakes collapsed in the middle. Taste great though. I made these cupcakes and they fell in the middle after cooling slightly. What could have happened? I think what's wrong with the recipe is the oil. When I prepared to make them, I looked at the amount of oil in the recipe-1 cup of oil is way too much in my opinion. I only added what the box called for, which is 2/3 cups , I believe. They were awesome-so good! I also over-filled my liners a bit more than 2/3 even though the batter is very thick and they rose all the way to the top and did not sink in. I'm not a cupcake fan but needed to make a couple dozen for a family event a couple years ago and I didn't want to pay for overpriced dry store bought ones either so I found this recipe and it makes the best cupcakes ever! I am the cupcake queen in our family now and it's my special treat for family events. I especially love how it can be altered to customize any flavor your heart desires. Thank you so much for sharing this! I've used a similar recipe in the past but I decided to try your's tonight. I have to say it was a disaster! I came back to the website to make sure I did everything the recipe said. And I did. I took the cupcakes out of the oven and they were beautiful and fluffy. I sat down to read some e-mails and when I turned back to the counter, the cupcakes were concave and horrible looking. I have no idea what happened. I think it's the amount of oil in this recipe. I tried a similar recipe that called for 2/3 cup oil instead of 1 cup and my cupcakes came out perfect - moist and delicious and didn't sink at all. Try again using less oil. These turned out perfect and did not sink when I baked them at 325 degrees for 22 minutes. Thanks chef in training for a great recipe! I found your recipe on Pinterest about two years ago, and now I use it every time I make cupcakes/cake! It is so good and they always turn out! Thanks! I had the same problem that many others had: I made as directed and ended up with shrunken cupcakes. Now, I don't have an issue with that as frosting could fix it, but the other problem was more serious: The cupcakes on the inside were dense, near flavorless, tasted underdone which they were not, and tasted much like a pancake. I will likely have to throw these away which I almost never do with baked goods. I am not mad, but would like to let you know, like so many others, that the recipe itself is not quite right. I agree that it is likely the amount of oil used that is throwing these off. What I did was add 6 Tablespoons of a cake upriser, which is a mixture of 1 1/2 cups of all purpose flour, 1 cup of sugar, 2 teaspoons of baking powder, and 1/4 teaspoon of baking soda. I do this because the box mixes are now 15.25 instead of 18.25. The cupcakes rose beautifully!